The eBOX510-820-FL, an extremely small fanless embedded computer with an overall height of only 37.5mm (95.4mm in depth and 132mm in width), is based on an ultra low-power Intel Atom Z530 processor up to 1.6GHz or Z510 processor up to 1.1GHz with up to 2GB of dual-channel DDR2 system memory. Powered by the Intel System Controller Hub US15W with integrated Intel GMA 500, the eBOX510-820-FL offers advanced graphics and 3D performance. 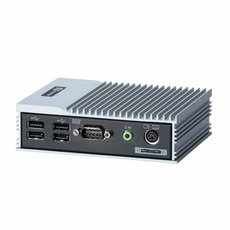 Its power consumption is less than 10W in common used, making the eBOX510-820-FL an optimal solution for power-sensitive embedded applications. This fanless box computer built with low-cost and power-effective in mind is a tiny application-ready system for DSA, car PC, medical healthcare, entry-level gaming, and in-flight infotainment.